Victoria, Mahe (Seychelles) – August 8, 2017 (travelindex.com) – Visibility is integral and it alone remains the key to success. Visibility keeps tourism destinations relevant. Following the discussion last week on the economic status of our island Nation, Air Seychelles confirmed the discontinuation of its Dusseldorf flight and a reduction of flights on its Paris run. This follows the suspension of its Durban route. Any loss of flights to a tourism destination is concerning, and more so when it touches key tourism source markets. Seychelles needs more than ever before to work in total unity to ensure that other airlines do not follow suit. The remarkable success of our fragile tourism industry in recent years must not be taken for granted. Though we as Seychellois believe that we have the most stunning beaches and array of islands on the planet, every other similar touristic destination shares the same belief. This means that we are fishing from the same pond, and solely relying on our country’s beauty to fill up hotel beds year after year is an unrealistic expectation. Last week, I was privileged to be able to represent Saint Ange Constultancy in the Berau Region of Indonesia. I want to thank Mr. Nico Barito and his team for their kind hospitality, assistance and, above all, friendship, which made this memorable trip possible. I visited some of the regions of this province and appreciated the wonders that each island has to offer. I was left in awe of the country’s unique culture, nature and wildlife, in all their diversity and splendor. In Indonesia, more particularly in Kutai Kartanegara, I saw the drive to put culture at the center of their development, whilst providing entertainment with a difference to the Indonesians. Their International Folk Art Festival of Tengarong City provides a platform for countries of the world to showcase their music and dance alongside Indonesians. It was a nostalgic reminder of what the Carnaval International de Victoria of Seychelles was also achieving for our country as it provided much needed entertainment for the Seychellois who descended in droves for the annual event. I have every faith that with the youth of today, the future of Seychelles will be very bright indeed. I would like to commend the ongoing efforts of youth groups, like SYAH, which are working very hard to steer our country in the right direction. Finally, it is important to again acknowledge all who are diligently reposting the Saint Ange Tourism Report weekly. Your continued support is greatly appreciated, and is helping us to go from strength to strength with each new Edition. Despite occupying less than 0.1% of the earth’s surface, coral is main reason why travellers choose to visit tropical destinations. Coral is big business. In a recent publication by Spadling et al. (2017), it was revealed through an innovative combination of data-driven academic research and crowd-sourced data that the world’s coral reefs contribute to 70 million trips per annum, showing that coral reefs are a powerful driving force for tourism. The study also revealed that coral reefs represent an astonishing $36 billion a year in economic value to the world. Of that $36 billion, $19 billion represents actual “on-reef” tourism like diving, snorkeling, glass-bottom boating and wildlife watching. The other $16 billion comes from spillover effects of coral reefs; including world class seafood, beautiful views of white sandy beaches and crystal clear waters, charter fishing, bareboat sailing, cruise shipping, helicopter and seaplane rides, water sports, whale watching, etc. Unfortunately, there is also a grim side to increased tourism activities. Breakage of coral colonies and tissue damage from direct contact such as walking, touching, kicking, standing, or gear contact is a major issue. Boat anchors can cause breakage or overturning of coral colonies and tissue damage. Moreover, there may also be changes in marine life behavior from feeding or harassment by humans. Tour operators, hotel owners and government have a responsibility over the protection of coral reefs. Proper education to visiting tourists and locals are essential for proper management. One emerging resolution that is proving to be effective is the modeling of the economic contributions of coral reefs. An example of this working is in Bonaire, a small Caribbean island. In Bonaire, it was demonstrated that coral reefs generate approximately $23 million from its related activities, and in contrast it would take a mere $1 million to establish strict protection. This was an easy sell to the local policy makers, who have established strict laws governing coral reef protection in Bonaire (Talbot & Wilkinson, 2001). Human impacts are not the only cause of reef devastation. In 1998, Seychelles underwent a major El. Nino event which had caused the destruction of over 90% of the live coral cover. When major disasters such as this occur, it gives rise to unwanted algal growth. The photographs depicted below were taken during my field research. They demonstrate the contrast between a coral dominated system and an algal dominated system. Herbivorous fish species such as parrotfish, surgeonfish and rabbitfish help promote coral recovery by grazing on the unwanted algae. However, these fish species are also a major delicacy in the Seychelles, forming over 60% of the total artisanal catch. Moreover, fishing of these fish species is not regulated in the country, making them susceptible to over-fishing. Following the 1998 bleaching event, the coral in Seychelles had shown some recovery, but suffered another El. Nino event in 2016, taking things back to square one. Natural disasters are becoming ever more frequent with climate change on the rise. Tropical destinations such as Seychelles will have to act quickly to safeguard their coral reefs. Science needs to be incorporated more efficiently into governmental policy, as has been done in Bonaire. I have dedicated my PhD research to investigating the role that herbivorous fish species play in promoting coral reef resilience around the Seychelles islands. So far I have discovered that rabbitfish are playing a key role in regulating algal growth. I have also found that the Marine Parks around the Inner Seychelles Islands are not working effectively to promote herbivorous fish numbers. It is plausible that the lack of enforcement around the Inner Islands are making the marine parks an attractive fishing spot for poachers. It is hoped that my research, along with that of other scientists, will help Seychelles introduce regulatory procedures to manage crucial fisheries such as that of herbivorous fish. “It’s clear that the tourism industry depends on coral reefs. But now, more than ever, coral reefs are depending on the tourism industry”- Dr. Robert Brumbaugh, Director of Ocean Planning & Protection, The Nature Conservancy. The United Nations World Tourism Organisation’s (UNWTO) Secretary-General, Dr. Taleb Rifai, was in Mauritius until 2nd August. He was invited by Air Mauritius on the occasion of the 50th anniversary celebration of the company. 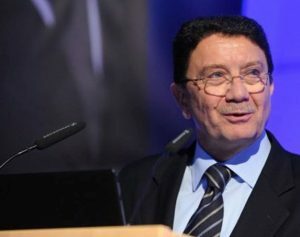 Taleb Rifai also participated in various activities during his stay, such as working sessions with the Ministry of Tourism and Air Mauritius, and a seminar on aviation and sustainable tourism. He also launched the “Travel, Enjoy and Respect” campaign in the context of the international year of sustainable tourism for development. Several visits around the island were scheduled for the UNWTO Secretary-General during his visit to Mauritius. Dr. Rifai was being accompanied by Elsia Grandcourt, the UNWTO Director for Africa. The Seychelles Tourism Board (STB) has expressed the desire the see further growth of its relationship with Ethiopian Airlines, for the betterment of both the airline and the island destination. The Chief Executive of the Tourism Board, Mrs. Sherin Francis, on Tuesday met with the outgoing Ethiopian Airlines’ area manager for Seychelles, Ms. Meseret Tekalign, and her successor, Ms. Meron Tsegaye. The meeting was attended by the Tourism Board’s Deputy Chief Executive, Ms. Jenifer Sinon, and Senior Marketing Executive, Mrs. Amia Jovanovic-Desir. Mrs. Francis took the opportunity to thank Ms. Tekalign for her dedication and continuous collaboration with the island’s Tourism Board during her time at the helm of the Ethiopian Airlines’ office in Seychelles. Ethiopian Airlines — Ethiopia’s national carrier — is described as the fastest-growing airline and the largest on the African continent. The airline, which uses its strategic hub in Addis Ababa to fly to Seychelles and beyond, started with three weekly flights to Seychelles for just over a year, before withdrawing on March 1, 2014. The airline resumed the thrice-weekly services at the end of September 2014. Ms. Tsegaye has given her commitment that she will be following in the footsteps of her predecessor and see what more can be added to the service. After adding a fourth flight to the Seychelles route in October 2015 and a fifth flight in December 2016, Ethiopian Airlines recently announced that it will be adding a sixth weekly flight to the island destination as of December 2017. The Seychelles Tourism Board’s Chief Executive remarked that more frequency also means more flexibility for travellers, while highlighting the fact that Ethiopian Airlines also supports the Seychelles’ Chinese tourism market as it provides good connections to the Chinese travellers, especially those travelling in groups. Mrs. Francis has highlighted Tourism Board’s intention to seek further collaboration with the Ethiopian carrier in the near future, to support twin-center holiday packages targeting specifically the US market. Ethiopian Airlines has already recorded a few firsts in Seychelles. It was the first airline to bring a Boeing 787 Dreamliner aircraft the island nation’s shores in 2015, while in 2016 the airline landed Africa’s first and most technologically advanced A350 in the Seychelles. It is through the promotion of a country’s culture that their tourism industry may be consolidated. Without people, there is no culture. Often the bold statement of putting people at the center of development is aired for political mileage, but how many really believe that this is indeed a requirement? In Kutai Kartanegara of Indonesia, Mrs Rita Widyasari, the Bupati or Premier of Kutai Kartanegara, invited me to not only witness the Indonesian pride of their culture, but also their participation in a series of ceremonies and events that showcased Wonderful Indonesia in all its diversity. The International Folk Art Festival brings countries of the world together to showcase their music and dance alongside Indonesians. Musical Groups accompanied by dancers were present from Europe as well as Asia. In the presence of the Premier Mrs Rita Widyasari, and alongside Dra Sri Wahyuni, the local Head of Tourism Department, I sat with different foreign Ambassadors accredited to Indonesia who were present to see their country’s group perform. Present were H.E. Maria Gustava, the Ambassador of Mozambique, H.E. Igor Kaczmarczyk, Ambassador of Poland and H.E. Alexandrina Guigova, the Acting Ambassador of Bulgaria. One dance and music group present among many was the Folklorika Group from Bulgaria which was headed by Evelina Pavlova. Good news for Seychelles with a new air access linking the mid-ocean islands with Australia. The Seychellois diaspora in Australia is large, and the Australian Seychellois Community is always on the look out for a more direct connection and at the best rate. John Savage of Global Travel media writes:- SriLankan Airlines held functions in Sydney and Melbourne recently to announce direct flights between Melbourne and Colombo commencing on 29th October, 2017. Agents, Operators and Media made up the 150 travel personnel in attendance at Sydney’s Shangri La Hotel on 27th July. The national carrier’s new daily direct flight schedule marks a long anticipated return to Australia by the Oneworld member. Travel and Music Guru, Glenn A Baker was the keynote speaker and entertained the audience with history and humour following a recent trip to the country. SriLankan Airlines’ Chief Executive Officer, Captain Suren Ratwatte previously outlined how the return of the airline strengthens long standing ties between the countries. “We recently celebrated the 70th anniversary of diplomatic relations between our nations and the addition of Melbourne signifies our strategy of optimizing the Airline’s network with our restructuring. This also means that we have connected another continent to our global route map. Given the number of Sri Lankans residing in and around Victoria, we fulfil a need for a direct service. We are proud to welcome all the diverse residents of Victoria who can now enjoy the direct connections when visiting their friends and families throughout our network.” he said. The Airline will operate Airbus 330-200 aircraft on the route, offering modern in-flight comforts along with its award winning service and the world renowned Sri Lankan warmth and hospitality. Economy fares start from AUD $820. Australia is home to one of the largest Sri Lankan expatriate communities, many of whom reside in and around Melbourne, the capital of Australia’s ‘Garden State’, Victoria. This factor, together with the tremendous potential for business travel and Victoria’s growing student population convinced the Airline to plan for the launch of non-stop daily services to Melbourne. Australian visitation figures increased by 10.4 percent to 6,360 in the 12 months to June, 2017 and the airline expects considerable further growth in these figures following the introduction of the direct flights.